One of the most noticeable effects of gum disease is receding gums, a condition where the gum line moves down the root of the tooth. Once the gums have receded, they do not grow back. Receding gums can affect the appearance and health of your smile. If you are concerned about receding gums and the appearance of your smile, set up a consultation with Dr. Frederick Olden, a Highland Park periodontist, for a customized treatment plan. Gum recession is associated with a number of concerns including tooth sensitivity, cavities, root exposure, and esthetics. Without adequate gum tissue, you may be at an increased risk of gum disease and experience bone and gum deterioration over time. If you are embarrassed by the amount of tooth showing when you smile, talk with Dr. Olden, your Highland Park periodontist, about tooth gum grafting procedures that can restore your smile. Gum grafting can be used to modify the gum line to create a more attractive smile. Connective Tissue Grafts - These are the most common types of gum grafts performed and are used to treat root exposure around one or more teeth. Dr. Olden will cut a flap of skin from the roof of your mouth and remove tissue from under the flap. This flap is stitched back down and the excised tissue is stitched to the gum tissue around the exposed root. Over time, the attached tissue will grow together with the existing gum tissue to form a higher gum line. Free Gingival Grafts - These are similar to connective tissue grafts except that a small amount of tissue is taken directly from the roof of the mouth. The tissue is placed and attached to the gum area that needs to be treated. Our Highland Park periodontist often recommends this method for people who have naturally thin gums. Pedicle Grafts - In this procedure, the gum tissue is grafted from tissue around the tooth in need of repair. A small flap is partially cut away so that one edge remains attached. The flap is then stretched to cover the exposed root of the tooth. This is a preferred method for patients that have enough gum tissue around the tooth in need of repair. In some cases, Dr. Olden may turn to a tissue bank to perform the gum graft. Are you looking for Highland Park periodontist who can treat receding gums? 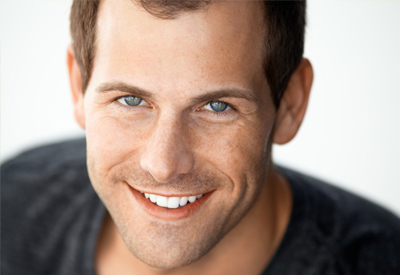 Talk with Dr. Olden today about gum grafting procedures that can restore your beautiful smile.